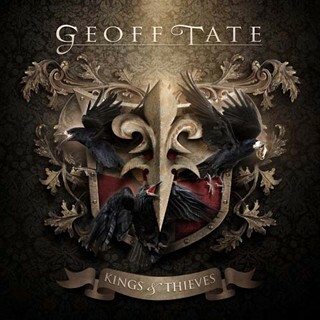 For those keeping track, Kings & Thieves is Geoff Tate‘s second solo effort, the follow-up to his 2002 debut simply titled Geoff Tate. That album received the cold shoulder by Queensryche‘s core fanbase and drifted into the record cut-out abyss about as quickly as it arrived. The album lacked direction and was much too eclectic to appeal to followers of a particular subgenre. There’s been quite a bit of drama in the Queensryche camp as of late — for starters, inner turmoil within the progressive unit became public in the spring of 2012. It was followed by the band ‘quitting’ on Tate prior to a show opening for the Scorpions and later came his ‘official’ dismissal from the band. Replacing Tate as the voice of Queensryche is Crimson Glory frontman Todd La Torre, who is a dead ringer for dismissed vocalist. By all accounts La Torre can handle the ‘classic’ material, but the true test will be when it comes to writing new songs and how it will be received. Geoff Tate has gone on record several times and made mention that he does not consider Queensryche a ‘metal’ band. He’s right — the band hasn’t been metal since they issued Operation: Mindcrime way back in 1988. However, Tate vowed to return with a hard rocking progressive effort — his first since parting ways with Queensryche. Kings & Thieves, at first listen, sounds rather ‘average’ but with each listen the album gets better and better. True to his word there are progressive elements in the songs — I liken them to an edgier, contemporary version of Genesis. Kings & Thieves has many stellar moments — “Take A Bullet” mixes the core elements of hard rock and pop with a driving progressive groove. “She Slipped Away” is a lyrically brilliant mid-tempo track with a killer hook and chorus. “The Way I Roll” kicks off with a saxophone intro then launches into a hybrid progressive, hip-hop, hard rocker that works extremely well. “Say U Love It” has an infectious chorus that sticks in your head like a flea on a stray cat. “Dark Money” is another lyrically deep moment on Kings & Thieves, and I’m sure there’s a great back-story behind the inspiration of the track. If you’re expecting an album that is a throwback to the days of The Warning, Rage For Order, or Operation: Mindcrime this effort might leave you disappointed. Kings & Thieves is a solid effort from beginning to end and should silence some of Tate‘s naysayers. It’s hard to say if he and Queensryche will reunite down the road, but if they don’t Tate has the abilities to forge his own path as a solo artist — and Kings & Thieves is proof of that.